Welcome on board everyone, or as our German friends would say, "Hello!" 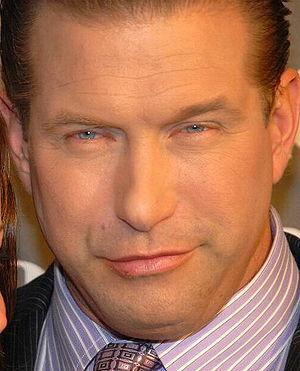 I'm Stephen Baldwin. You may recognise me from the front of that pamphlet you're holding. This is Stephen Baldwin's Excellent Tour of Hollywood, On a Bus, driven by Me, Stephen Baldwin. I bet you didn't know I was a bus driver! Well, things aren't so flash in the movie business lately. Hold my whiskey... thanks. God, I'm Irish! Let's all buckle in and get started. Actually, I couldn't afford seatbelts. Whenever I'm not talking -- not often, I assure you! -- feel free to ask me questions about me! I'll respond by talking about myself. Now I know you folks are probably wanting to see the sights -- and you will! But mostly, I'm just going to talk about myself and drive past them all at 60 miles an hour. Damn I used to be beautiful. Well ma'am, I'm glad you asked. Coming up on your left you'll see Dr Long Moon's Centre for Puffification of Celebrity Aspect, where I had some minor work done removing fat from my neck and inserting it into my cheeks. I'm telling you, that is the last time I select a medical professional based on the number of words on his park bench advertisement. I suppose the whole problem stemmed from the fact that I'm not such a flash reader. In fact, I've only just started learning! Don't worry though, I could do this tour with my eyes closed. "Please open your eyes again." Right you are, concerned passenger. It all began when my mother Evelyn was working as a waitress in Jumbo's Clown Room -- that's it there, on the right! Those were tough times; she couldn't even afford the bus fare to get me to school. I took to busking outside all Ray Charles style. I made enough money to get to school once a month, so I chose to only turn up on gym class days. By the way, you can read about all of this and more in my ghost-written autobiography, From Failure to Another Failure, Repeatedly: The Stephen Baldwin Story. "Are you still making movies?" Thank you for that question. Did you know that I starred in The Usual Suspects? Yes? Well I bet you didn't know that I was also in Slap Shot 2: Breaking The Ice! Yeah, not many people saw that one. We had a great premiere, though; the Egyptian theatre (just up here on the left) was really packed out! We wanted to rent the Kodak, but they didn't have a DVD projector. Anyway, spools of film? That's the past! We held the first ever Hollywood premiere for a direct-to-video release -- I was a part of history! To answer your question, I suppose my recent work has been the result of pure chance! I mean, there's twice as many celebrity reality television shows in production than films; the way I see it, starring in Celebrity Mole Hawaii, Celebrity Mole Yucatan, Celebrity Apprentice, Celebrity Big Brother, Born-Again Christian Celebrity Jeopardy, and Ty Murray's Celebrity Bull Riding Challenge -- that's all the product of good luck, hard work and having one hell of an agent! ...um, yeah. Hey, do you guys like celebrity houses? We're taking a little detour up into -- you guessed it -- Beverly Hills! "Why have we been idling here for so long?" Well, that property over there is owned by none other than J.J. Abrams. Yes, I would gasp too -- that is, if he wasn't my close personal friend! I'm waiting for him to leave his house and walk towards that black Pontiac parked on the curb. You see, what you are witnessing is Hollywood business in action: I'm going to orchestrate a "chance" meeting between me and Mr. Abrams so I can pass him my feature-length pilot script, Marooned on an Island and also Bizarre Events Happen: The Stephen Baldwin Story, Metaphorically Speaking. Interestingly, his first name is actually spelt "J.J.". Hey, here he comes now! I'll be back real soon folks. You can see right to the edge of the ocean... of smog. "Stop ramming J.J. Abrams' car!" Haven't you folks ever heard of bumper tag? It's a crazy game that us Hollywood celebrities play all the time! It's our way of supporting the American auto industry. Anyone here from Detroit? No? Ah, looks like J.J. isn't too pleased to go up against the Baldwin Bus! He's a good guy. Next stop, Hollywood sign! Everybody off the bus! Let's breathe in this sweet mountain air. On your way off, I'll need you to drop your wallets and cell phones in this mini-safe. The thing about the Hollywood hills -- the important thing -- is that they are full of crack addicts. Check out the view! You can see all the sights, from the Hollywood Bowl to the Atlantic Ocean! This here is where I brought my first girlfriend to break up with her. If you look down the hill a little way, you can still see her leg sticking out of that dumpster! Now, if you'll all just keep facing down the hill, try and keep as still as you can. Hear that sound? That's the Hollywood freeway! That other sound was me, taking the safety off on my gun. I know what you're thinking: no, I'm not talking about one of my 18-inch biceps! I'm glad you asked. 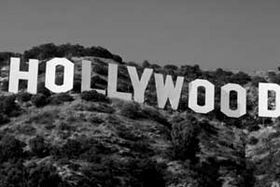 You, yourself, are becoming, currently, a part of Hollywood history! A celebrity, robbing a tour group... ridiculous! This'll get me back on top, surely. I've already started writing the tell-all book, all O.J. style: If I Did It, Here Is How It Would Have Been Done By Me, Personally: A Tale of Desperation written entirely by Stephen Baldwin, and not by one of his many Brothers. Hollywood chews you up and spits you out, folks. But boy -- what an experience!